The Quran clearly commands that Haj is obligatory on those who can afford the expense. So it always rankled many Muslims that India's government subsidized their most important of pilgrimages, to Mecca. Now that newly-elected UP's Waqf and Haj minister Mohsin Raza has spoken against the "misuse" of Haj subsidy (earlier union minister for minority affairs Mukhtar Abbas Naqvi called it a blot on Muslims), the issue of Haj subsidy is back in the spotlight. Most Muslims wants to do with the subsidy which the sangh parivar has called it a "tool of minority appeasement." In 2016 the government gave nearly Rs 405 crore subsidy for one lakh pilgrims who travelled to Mecca through the Haj Committee of India. This year, after the restoration of the country's Haj quota cut by 20% by the Saudi authorities in the last couple of years, the total Indian Haj quota is 1.70 lakh (1.25 lakh through Haj Committee while 45000 through Private Tour Operators) but the Haj subsidy is bound to reduce. Why? The government is complying with the Supreme Court's 2012 order directing the government to abolish Haj subsidy over a period of 10 years. "The subsidy amount goes to the airfare for Haj pilgrims which is much higher than the normal airfare for a return journey to Jeddah from India. Subsidy is an albatross around Muslims' neck and must end," says Yusuf Ahmed Kherada of Al Khalid Tours and Travels. 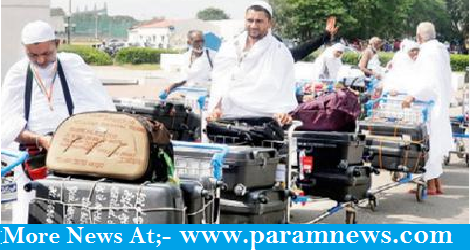 "Get a global tender for Haj travel and the airfare will reduce." A five-member committee, headed by secretary of Parliamentary Affairs Afazl Amanullah, is looking into whether subsidies have benefits and if pilgrims can travel paying less if there is no subsidy at all. "It is true the Supreme Court wants subsidy to end by 2022 and we are taking a wider perspective of the Haj policy," says Kamal Farooque, a member of the panel. Raza, many allege, was ill-informed about Haj when he said: "We will only let deserving persons who don't have means to go on their own, to go. If a person is a multi-millionaire he should not make the pilgrimage on government money." "Haj is not for those who can't afford it and multi-millionaires make the pilgrimage through Private Tour Operators where the journey is not subsidized," explains senior Shia scholar Maulana Zaheer Abbas Rizvi. "We don't want Haj subsidy. Let the government end it as per the Supreme Court (2012) order but politicians should not mislead the public." Continuing something Allah didn't command for Muslims is anachronistic and the community Muslims justifiably don't want it. Haj subsidy is albatross around our neck, say Muslim leaders The Quran clearly commands that Haj is obligatory on those who can afford the expense. So it always rankled many Muslims that India's government subsidized their most important of pilgrimages, to Mecca.